On sale or rip off? We all know it’s better to buy things on sale. Sometimes it really is a sale, other times the store has done a good job by convincing us it’s a sale! In the market, we know it’s good to buy low and sell high. We also know how difficult that is. What we can do is look back at history to see what “on sale” is and what “expensive” is. The measurement we look at is the P/E ratio. It gives us a “valuation” of the market to help us determine if it’s on sale or a rip-off. Using this, we can go back and see what kinds of returns we would’ve gotten historically if we bought at different prices (P/E ratios). The above chart is using actual historical results and the schiller PE ratio. Information is provided “as-is” and solely for informational purposes, not for trading purposes or advice. Historical performance is not necessarily indicative of future results. As the chart indicates, end balances are the highest when the beginning P/E is at 10 or below. 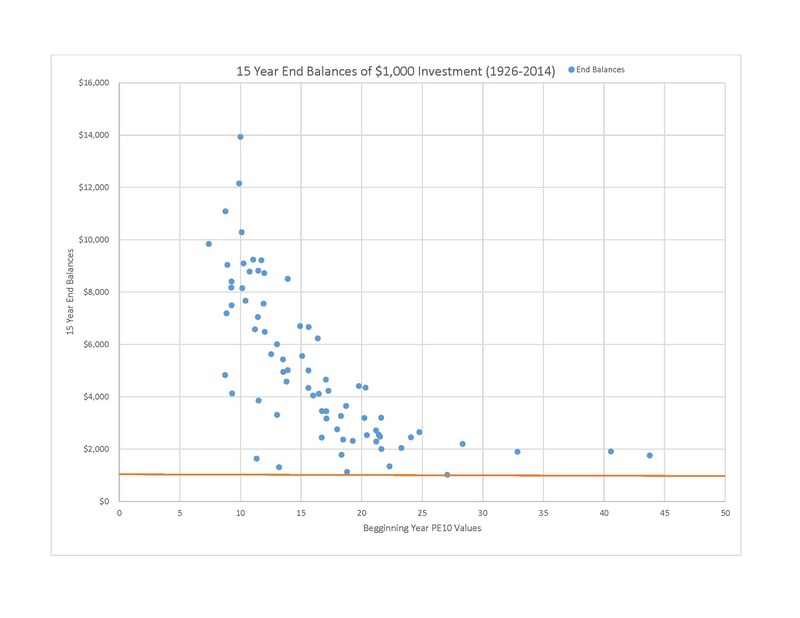 The 15 year end balances begin to drop off when you begin to get higher than 15. The historical P/E average is around 16. Today we are at 26.5. If history were an indicator then we’d be looking at an expensive market…. Not the best time to buy the dress you’ve been eyeing, better to wait till it goes on sale. That’s what the odds tell us. But the market can and will do what it wants when it wants. So we use this info to help guide us but it doesn’t dictate exactly what we do. what is correlation? does it matter to me? How many legs does your retirement stool have? Bitcoin? is this for real?? take it now or wait? Rate hike, how many more? Is the economy running HOT yet? Is the Journey or Destination more important? Sidways Market..what does it mean for you? Brexit - what just happend? Should I add my child/heir to the house deed to avoid probate? What is the Perfect Investment? 85% or 15%, which are you? Pullback, Correction or Bear Market? Medicare Open Enrollment Seminar - RSVP Today! What all do you do? How well do you know your advisor? Tax Season is over, Now What?